A walnut is a seed from a tree in the genus Juglans. Technically, a walnut is a drupe, not a nut, since it takes the form of a fruit enclosed by a fleshy outer layer which parts to reveal a thin shell with a seed inside. Walnuts are dry nuts which are enclosed between two semi spherical hard shells that are joined. As walnuts age on the tree, the outer shell dries and pulls away, leaving the shell and seed behind. The fruit inside has a characteristic shape of a butterfly, and the nut inside is edible that resembles the brain. Walnuts grow on huge deciduous trees, which can grow up to 40 meters in height. These nuts are harvested during December, but as they can be dried and consumed, one can find them all year round. Whether you call it a nut or a drupe, walnuts can pose risks to people with allergies, so use them with caution in cooking. It is a good idea to get in the habit of disclosing all of the ingredients in a dish to cope with allergy concerns and dietary restrictions. The Juglans genus is extremely large and well distributed. The trees have simple, pinnately compound leaves with resinous spots. The odor of the resin is quite distinctive, and the resin can be harmful to plants grown underneath walnut trees, which is why the ground under them tends to be bare. Representative trees can be found all over the world, although they are primarily concentrated in the Northern hemisphere. Walnuts are also found growing in Africa and the Southern reaches of the Americas. The nuts have been used in both sweet and savory dishes for centuries, with some species being more favored than others. One of the most popular varieties of walnut is the Persian or English walnut, which has a large seed and a thinner shell, yielding more edible meat per pound than other species. The Persian walnut came from the Middle East originally, although England established a monopoly on the trade at one point, leading to the associations with both regions of the Earth. Black walnuts are another commonly sold walnut species, as are white walnuts, also called butternuts. Some species such as black walnut are cultivated for their wood as well as the edible drupes. Commercially, walnuts are available both whole and shelled. Many consumers prefer to purchase shelled walnuts, since they can look for plump, glossy walnuts. Shriveled walnuts are not good to eat, and they can lurk inside any type of shell, which can be frustrating. Like many nuts, walnuts can be frozen until use, or stored in a cool, dry, dark place for several months. They are also pressed to yield their dark, rich, flavorful oil. Walnuts often appear paired with blue cheese in salads, mixed into stuffings, or in Middle Eastern cuisine with ingredients like raisins. They can also be candied for use in desserts, or used plain to provide a bitter contrast to sweet fruits. The uses for the walnut are myriad, which explains its enduring popularity as a cash crop. Walnuts are packed in energy content, 25 grams of walnuts, which is ¼ cup can provide around 123 calories. Walnuts are rich in omega-3 fatty acids. Many people try to compare the benefits of walnuts and almonds. Both are rich in nutrients, however walnuts health benefits show that it is the only plant source for omega-3 fatty acids. However, almonds also have their own benefits, and hence, shouldn't be ignored. Apart from omega-3, it also contains a good amount of copper and tryptophan, and is rich in manganese. 25 grams which is ¼ cup, provide around 163 walnuts calories. Important walnuts nutrition facts are listed in the table below. Dried fruits and nuts are the powerhouses of energy, as they are loaded with calories. But, these are not unhealthy calories. Dried fruits and nuts, especially, nuts are high in omega fatty acids and contain many micro nutrients which in small amounts are very beneficial to the health. One of the healthiest nuts are walnuts. There are many health benefits of walnuts, and making them a part of your diet will enrich your diet. Walnuts are very good for vegetarians, as they contain omega-3 fatty acids, which is almost absent in a veggie diet, as the only other source of omega-3 is fish. Hence, people who are vegetarians should definitely make walnuts as a part of their diet. Mentioned below are the various nutrients present in walnuts and the benefits of walnuts. Here is a list of the various benefits of walnuts, which can be contributed to the omega-3 fatty acids content present in them. Omega-3 is a very important nutrient, which can prevent many diseases. Walnuts have a high concentration of these good fats, which lower the risks of cardiovascular diseases, promote better cognitive function and have anti-inflammatory property that protect against asthma, rheumatoid arthritis and other skin diseases related to inflammation like psoriasis and eczema. Walnuts can lower the cholesterol level, due to the nutrients it contains, like antioxidants, phenols, vitamin E, gallic acid and ellagic acid. Ellagic acid in walnuts is an antioxidant compound that boosts the immune system. Its anticancer properties also helps in fighting the dreaded disease. Walnuts are great brain food. It is not only due to the wrinkled appearance of their shell that resembles the brain, but also due to the fact that they contain high levels of omega-3 fatty acids which plays an important role in the process of important nutrients entering the brain cells, and the exit of waste cells. Nearly 60% of our brain is structural fats which is primarily omega-3 fatty acids. Besides omega-3 fatty acids that prevents erratic heart rhythms and regulate plaque formation in blood vessels, the essential amino acid l-arginine in walnuts improves the elasticity of blood vessels. This ensures proper supply of blood to various organs. Omega-3 also helps to reduce depression and ADHD. Also, the omega-3 with manganese help to maintain bones in a good condition. Studies have shown that walnuts are effective in preventing gallstones (especially in women). Melatonin which is a powerful antioxidant and also induces a good night's sleep, is present in walnuts in the bio-available form. Hence having a handful of walnuts before going off to bed helps in getting a sound sleep. Walnuts are an excellent source of a proteins, fiber, B vitamins and minerals like iron, magnesium, phosphorus, copper and manganese. These nuts are helpful in easing constipation due to their laxative effects. Lp(a) is a lipid compound that increases blood clotting and increases the risk of atherosclerosis and heart diseases. Walnuts reduce the amounts of this lipid compound in the body. Research indicates that walnuts may reduce the risk of Alzheimer's disease by arresting the formation of the amyloid plaques that are found in the brains of patients who suffer from this debilitating disease. Most nuts are good for skin. Benefits of walnuts for skin are due to the antioxidants they contain. As nuts contain vitamins A and E, they protect the skin against free radical damage, thus preventing the signs of aging. Also, the good fats which are omega-3 in walnuts, help to maintain a nourished and smooth complexion. Benefits of walnuts for hair include stronger hair, more conditioned and moisturized hair. Also, walnuts contain micro nutrients which prevent hair fall from occurring. Almonds are other good nuts preferred for hair health. You can mix almond and walnut oil and apply it on your scalp to condition it. Also referred to as the 'Imperial Nut' by the Romans, black walnuts health benefits include preventing heartburn, high blood pressure and various skin disorders. Black walnut benefits include their use in getting rid of intestinal parasites and tapeworms and help in ensuring proper functioning of the thyroid gland. For a healthy life, the ratio of omega-6 to omega-3 fatty acids should be maintained at 4:1. However, dietary changes have disrupted this ratio and in an average American this ratio stands at 20:1. Walnuts are one natural food that have the perfect ratio of omega-6 to omega-3 fatty acids, which is 4:1. Well it's true that walnuts are a rich source of calories. But the fact that these nuts have a number of health benefits can't be overlooked either. 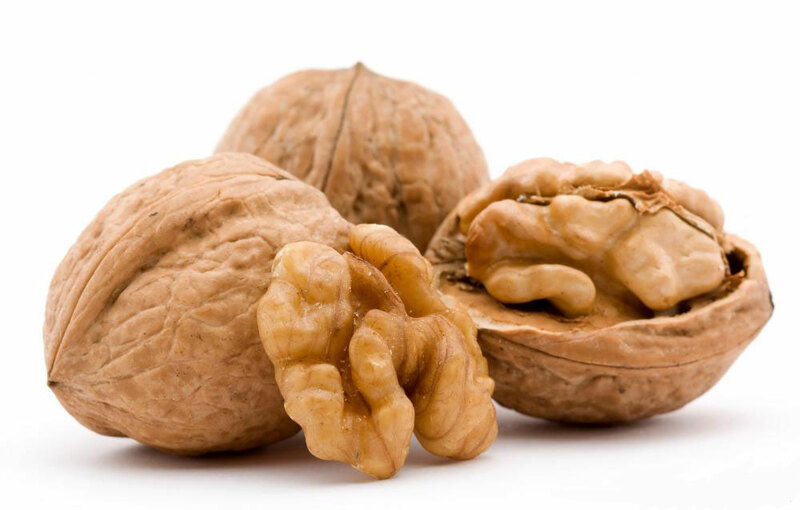 The key is to substitute foods with high levels of saturated fats with a handful of walnuts everyday. 1.5 oz of walnuts per day are enough to make the most of the walnut health benefits. Are you wondering how to incorporate this wonder nut in your diet? Well, how about replacing pepperoni with finely chopped walnuts on your pizza? You could also sprinkle your oatmeal or breakfast cereal with some chopped walnuts. Walnuts could also substitute bacon or eggs for protein. Or simply, you could chomp on a few walnuts instead of grabbing a handful of cookies when hungry. Despite high calories content, walnuts are believed to aid in weight loss as these nuts are filling and reduce one's food cravings. In fact research has shown that weight gain by consumption of walnuts in moderate amount is insignificant as compared to its other health benefits. Common walnut (or English walnut) can cause softening of the stools and bloating, as well as weight gain unless other fats are removed from the diet. Common walnut may cause allergic reactions in people who are sensitive to it. Consuming black walnut may result in loose stools or diarrhea. Some patients may be allergic to black walnut, in which case side effects could be severe. Black walnut, when applied to the skin, may result in a rash in the same area. Black walnut might be unsafe when applied to the skin. It contains a chemical called jugione that might cause tongue or lip cancer, especially if applied daily.